Okay, I’m beat. It was a jam-packed weekend of record store visits, car rides to the big city, good food, incredible live music, and swanky hotel room living. I’ll tell you the short version as I’m tired and ready to sleep for 12 hours. This was Record Store Day weekend. There wasn’t a bunch of stuff I was particularly excited to get, but what I did want I was able to snag early Saturday morning at Karma Records of Warsaw. Built To Spill’s Untethered Moon and Of Montreal’s Snare Lustrous Doomings were the two albums I really wanted and I was able to snag them no problem. As a bonus I grabbed High On Fire’s Surrounded By Thieves on blue vinyl. Karma Records had their best turnout yet and I’m happy for the folks over at Karma. In the afternoon the wife and I headed three hours south to Indianapolis to see Sufjan Stevens. 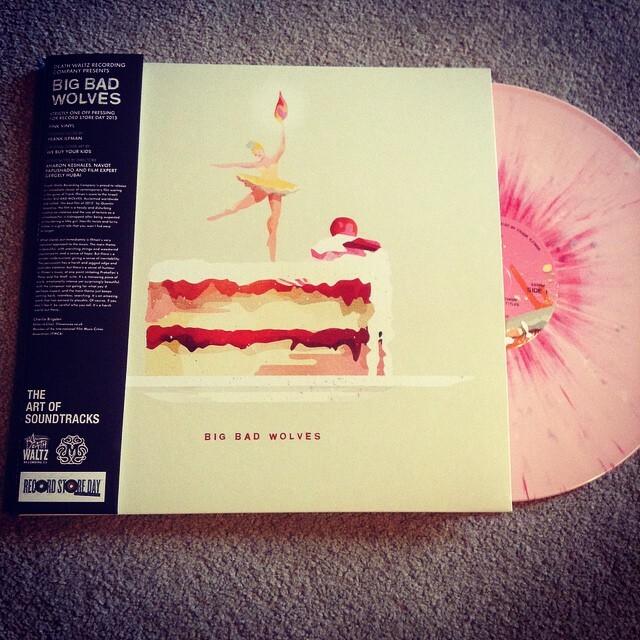 We stopped at Luna Music in Indianapolis and I snagged the one-time pressing of the score to Big Bad Wolves courtesy of Death Waltz Recording Company(it’s absolutely incredible.) We had reservations at the Hilton in downtown Indy. The hotel was nicely swanky. We drove over to the Murat Theater and parked. Ate in the wonderful Bier Garden of The Rathskeller. The food was great and the Rathskeller Seasonal Bier I had was quite tasty. The show? It was started out by a band called Cold Specks. Very good band with a bit of soul and indie grit. Great band. But the highlight was Sufjan Stevens. Easily the best show I’ve seen in ten years. What I expected was a nice, low key show with some great songs. 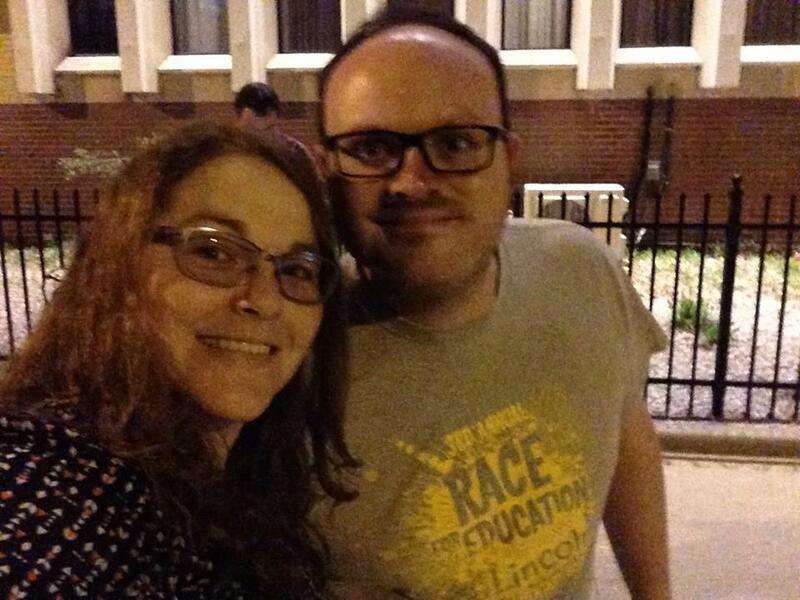 What I got was a wildly unpredictable show, with some amazing reworkings of songs from his newest record. Speaking of the new record, Sufjan and his band performed Carrie and Lowell in its entirety with a quick detour towards the end. The songs still retained their intimacy and earnestness; but Sufjan reinvented these tracks with some of the electronics he’s been toying with for the last few years. The results were absolutely stunning. The last track on the album, “Blue Bucket Of Gold”(and one of my favorite songs on the album) turns into this absolute cathartic noise explosion. I can’t put into words how intense and emotionally overwhelming this song was live. In fact, with the visuals(several long screens behind the band that showed old family home movies, as well as beautiful landscapes and abstract colors) as well as the lights took you to another place watching the show. Sufjan spoke of his great-grandmother and how her death affected him. It was a funny and poignant story. For the encore, the band returned to the stage to play some classics from Sufjan’s past, closing the show with his classic “Chicago”. The wife and I grabbed some breakfast in downtown Indianapolis before stopping off in Noblesville for some clothes shopping. We made it home around 3:45pm today. Built to Spill, High on Fire both excellent bands, glad to hear about some good finds. Yes, it was a good weekend for music. 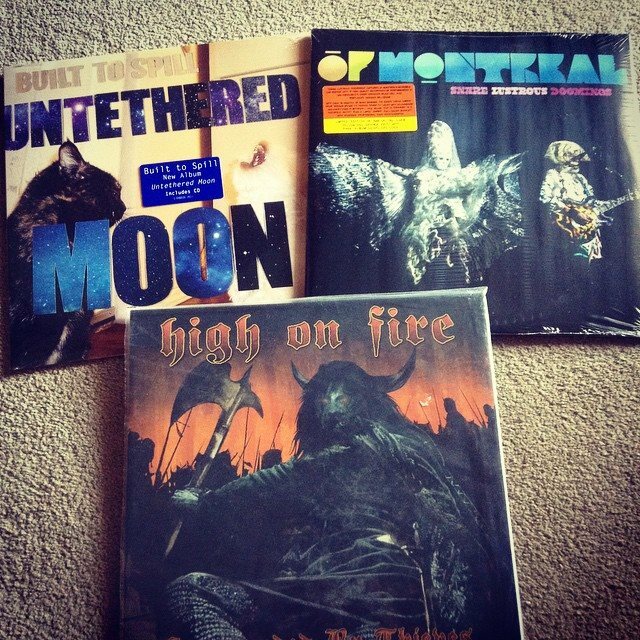 Nice one Mr H, the High on Fire LP is a brilliant, brilliant one – Worrrggggghhh!! Thanks. Yeah, the High On Fire is in a class of its own. There’s only one Matt Pike, thankfully for the sake of humanity. Was that a RSD one? Nope. Just one that’s been taunting me for months. I finally decided I needed to take it home. The blue vinyl was a nice surprise. The BTS is great. Probably their best in awhile. Great guitars and lots of catchy pop hooks. And the Of Montreal is classic Kevin Barnes. An hour and a half of music. Sounds like the Built to Spill I love! Sounds like a great gig too btw. It was. Completely blew me away.